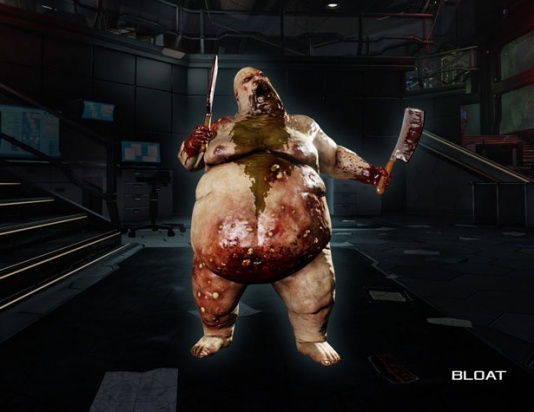 The Bloat is an uncommon specimen in Killing Floor 2. It is classified as a medium enemy. 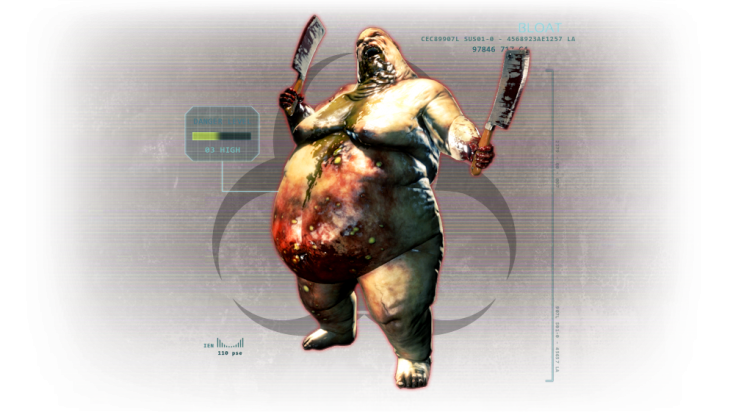 Bloats appear as overweight humanoid males with huge body mass, wielding 2 large cleavers in their arms. They are extremely durable and slow, while also possessing the ability to spit acidic bile at their prey. They fulfill the role of the literal meat shield in the specimen line-up. Bloats move slowly when docile, and sprint up close. Should sprint if can sprint OR (if can sprint when damaged AND damaged) (i.e. if sprint chance met its value) AND if distance to player laying between 5.2 and 12 meters (520 units < distance < 1200 units). Should sprint when frustrated. Bloats boast a wide array of resistances to all damage types and only neutral to fire-emiting weapons. Bloats are greatly resistant to all ballistic weaponry. The Bloat also has special resistance values for specific weapons. Bloats only have one weak spot, which is the head, although the multiplier is minuscule. Their cleavers deflect attacks. 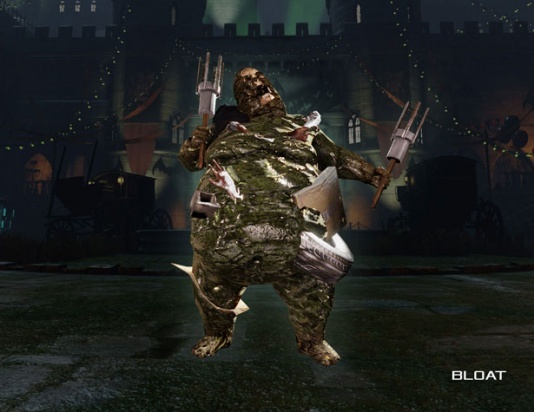 The Bloat is a large, tanky, slowing moving, close-range ZED. Bloats will attack by spitting acidic bile at players as soon as they get within range. 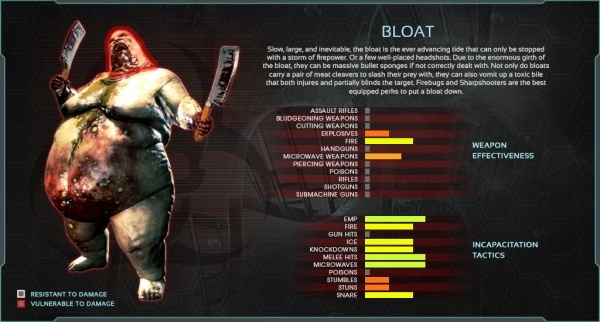 Bloat bile will blind players when they are hit, splattering their screen with varying amounts of bile depending on how much armor and toxic resistance they have. It will also continue to deal damage over-time after the initial hit for a few seconds. Bloat bile will destroy armor extremely fast, and continues to chip away at armor over-time for a few seconds after the initial hit. Bloats can also attack with their cleavers if players are too close to them and they are not able to use their spitting attack. Bloats will leave behind explosive bile mines when they are killed via sheer body damage. They will not leave behind mines if they are killed via decapitation or fire. The number of bile mines they leave behind increases based on difficulty. Bloats can block gunfire. When shot at, Bloats will cross their cleavers in front of their face to block bullets. When blocking, Bloats take 20% less damage, and incapacitating effects are 80% less effective. On Suicidal and Hell On Earth, Bloats have a very high chance to block when shot at. On Suicidal and Hell On Earth, Bloats gain the ability to spit bile while sprinting forward, drastically increasing their range and damage potential. On Suicidal and Hell On Earth, Bloats can also spit bile into the air around them, sort of like a toxic fountain of death. If a Bloat gets into range to spit, it may begin to spray bile all around itself, dealing damage in an area. 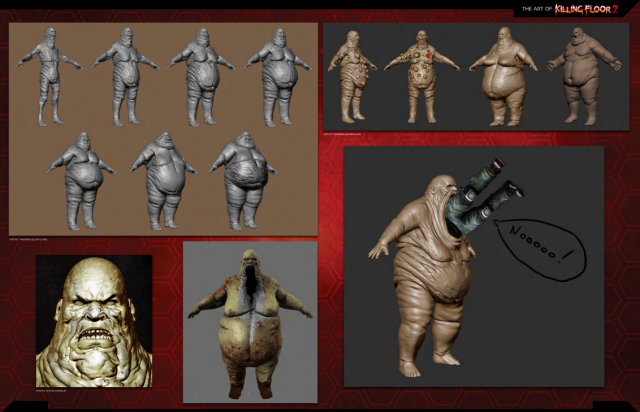 Bloat can strike through the other ZEDs. Bloat Bile has Poison power of 0. Unlike normal vomit attack, vomit damage of the body explosion does not scale with game difficulty. It is always 12 points of damage. Visual effect of the bloat bile lasts for 10 seconds and slowly fades out. Wearing armor prevents player from having the "pulse" effect. Amount of the puke mines to spawn on death: Normal - 0, Hard - 1, Suicidal - 3, HOE - 3. In PvP games AI Bloats does not spawn puke mines, player-controlled Bloats spawn 3 of them. Puke mines only spawns if Bloat's body has exploded on death. (PvP) Rally boost: forces AI Bloats to sprint, players do x1.2 more damage. Damage to doors (possible values) = 14 / 112. Bloat has a chance to block upon taking damage or when being aimed at. Bloat has a chance to block or evade certain damage sources. Chance to block after taking damage: Normal - 0, Hard - 0.1, Suicidal - 0.65, HOE - 0.85. Health loss percentage to trigger block: all difficulties - 0.1. Block chains (max): Hard - 4, Suicidal - 5, HOE - 8. Block duration - 1.25s, cooldown - 3.5s. Bloats are extremely durable as their purpose is to serve as literal meat shields for the other ZEDs. They tend to hide more dangerous ZEDs from view, such as groups of Gorefasts, Husks and especially Sirens. Bloats are extremely slow and rarely sprint, thus it is safe to ignore them to focus on killing other threats. However, do not let the Bloat get into spitting distance or it can cause high area of effect damage as well as destroy the armor of your team very quickly. Bloats have extremely high body health. It is extremely ammo inefficient to kill them via bodyshots. Furthermore, killing them via bodyshots tends to make them explode and leave behind bile mines, which will explode when stepped on and deal massive damage to players. As much as possible, take them out by headshots or with fire/microwaves. It is tricky to engage the Bloat in melee range as a Berserker without getting spat on. Try moving forward then backing off to bait out their spit, before going in for the killing blow. Although it is extremely resistant to all forms of ballistic weaponry, all ballistic perks can take out Bloats very quickly and safely via headshots. Weaker weapons will require multiple shots, while higher end weapons can take their heads off in one or two shots. While Bloats can block headshots, the cleavers are extremely small and it is very easy to shoot past the cleavers. Bloats usually do not drop dead immediately upon decapitation. Their headless bodies will continue to wobble around as they bleed out, and other ZEDs can hide behind their body as they die to use the Bloat as a shield. At close range, the Firebug can kill Bloats very quickly as Bloats are vulnerable to fire. The Firebug can safely kill Bloats via body damage without causing it to explode and leave bile mines on the ground. Bloats will drop dead immediately upon having their HP burnt out. If there are bile mines on the map, you can destroy them by shooting at them. Beware though, they explode when shot; make sure no teammates are standing near them when you shoot them. Bile mines also disappear upon clearing the wave.